Launched in 2010, the i-Pilot burst onto the trolling motor and fishing scene with its fair share of doubters. Here, eight years later, the i-Pilot has become a staple and an invaluable piece of technology to a lot of anglers with thousands more becoming more aware of its usefulness every day. Since 2010, Minn Kota has updated much of the software that is used in its i-Pilot system and warrants a more recent look into the technology. With that, we want to dive into the details of the Minn Kota i-Pilot in this short review. We will look at the various features, discuss the trolling motors that are compatible with i-Pilot, and finally take a look at how these features can change your fishing game for the better. If you have done any searching for Minn Kota trolling motors that are i-Pilot compatible, then you have probably come across the terms i-Pilot and i-Pilot link. These are two separate options with a major difference between the two. If a trolling motor comes with i-Pilot, it is controlled with a wireless GPS enabled remote that controls all of the i-Pilot features. While on the other hand, if a trolling motor comes with the i-Pilot link, it is Bluetooth capable and can be controlled with compatible GPS devices including your Apple or Android device. The i-Pilot mobile app delivers quick control of speed, steering, Spot-Lock, and AutoPilot. Unfortunately, not any GPS fish finder is compatible with Minn Kota’s i-Pilot link. You are restricted to Humminbird devices in this case. With the newer i-Pilot link models, you will also receive a much larger remote with a larger LCD screen that can integrate with your Humminbird device. Below is an in-depth look at the i-Pilot link control. With the amount you can do with the i-Pilot link remote, we want to direct you to the video below for a more in-depth look. Just about all models that are integrated with the i-Pilot system has the option for either the i-Pilot or the i-Pilot Link for most of the thrust options. Price does not differ much between the two, but if you have a GPS fish finder that you like, you might enjoy the link more. The plus side to the i-Pilot and its remote is that it is easy to carry around and use at any position on the boat and has been designed to give you optimal control over the trolling motor and the various i-Pilot features. 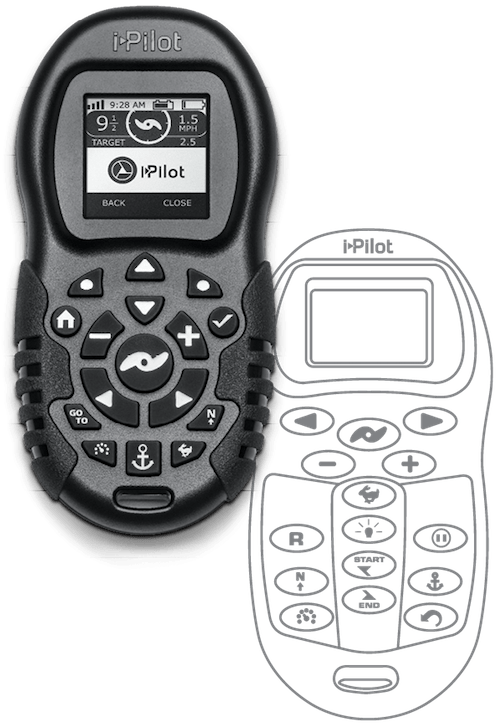 While we like how the Minn Kota i-Pilot link integrates with a GPS, the separate remote that comes with i-Pilot models is also a cool and self-intuitive device. The remote is smaller and is a pro or a con depending on your preference. A lot of people are going to like the size because you can easily keep it in your pocket or hang from a lanyard. It is water resistant and floats which makes sense for a device used on the water. We love the redesigned LCD screen which is much wider than older models. The on-screen menu is very easy to navigate after a few hours and a couple of cups of coffee. The home screen gives you full view of all motor functions currently in use as well as battery power, speed, and GPS signal strength among other things. The control buttons below the screen are very self-intuitive and the user’s manual that comes with the remote outlines everything in a very detailed manner. The layout of the controls is organized into four different categories including manual controls, tracks controls, cruise/autopilot controls, and spot lock controls. With your Minn Kota i-Pilot remote you can utilize the manual Copilot features that allow you to control speed, steering, prop power, and high-speed bypass from anywhere on the boat. Even with other automated featured engaged, control is never really out of your hands. Perhaps the most used feature and the most marketed feature of the i-Pilot GPS system is Spot-Lock. 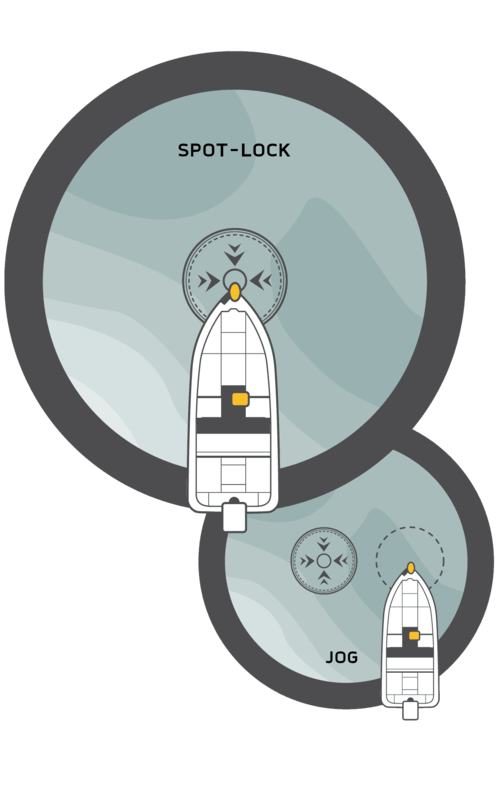 Spot-Lock is the GPS anchoring feature on i-Pilot that keeps your vessel located within a set of GPS points that forms a circle. When the GPS recognizes that the boat is within this set of points the motor is turned off. You can store up to six individual Spot-Lock locations on your device and reactivate these spots when you are within a quarter mile distance from the area with the Go-TO feature. Also, within the Spot-Lock function is Jog. Jog allows you to adjust the positioning of the boat relative the Spot-Lock coordinated by five feet in any direction. This is a cool feature that is useful in a lot of fishing situations and allows quick movement without having to manually adjust the positioning of the boat. Another feature with i-Pilot is the i-Tracks function. With i-Tracks, you can record specific trolls you have had success with and store in your remote or i-Pilot link platform. Once you are within a quarter mile of the start of the troll, your trolling motor can bring you to the start point and follow that same path. You can save up to six individual tracks with each being two miles in length at maximum. As you record a track, the remote stores several GPS locations along the path between the start and endpoint. When you are replaying a saved track, you are also able to move the boat towards the end of the of the track or the beginning of the track. This allows you to stay on sections of the troll that are being more productive from trip to trip. There may be issues with the accuracy of the playback so be sure to read on through our accuracy section. All i-Pilot and i-Pilot link trolling motors also have a cruise control function to maintain speed on a specific heading. The speed can be adjusted by 0.1MPH increments with a single push of a button. Cruise control can be used in conjunction with several other i-Pilot features such as i-Tracks (both recording and playback), Autopilot, and Advanced Autopilot. It is also important that you note the speed you have set as well as the environmental conditions when recording a track so that you can adjust settings during playback to get the most accurate results. Your trolling motor will also come with an Autopilot and an Advanced Autopilot function. Both of these features will allow you to put the boat on a set heading and allow the trolling motor to stay on that heading without any more corrections from you. There are some differences in the two features. Regular Autopilot simply uses a heading from a compass and does not compensate for current or wind which means you might have to manually correct the direction from time to time. Advanced Autopilot uses a set of GPS coordinates along a straight path from the motor direction when turned on and also compensates for environmental influences such as wind and currents. Now that you have a better idea of all of the features available on the Minn Kota i-Pilot, let's discuss how accurate these features are. In general, the i-Pilot system is one of the most accurate GPS control systems available to the public. With that, the accuracy is going to depend on a lot of other outside factors as well. We don't want you to think that it's going to be dead on every time you head out onto the water because there are going to be situations where you have to fight it more. One of the biggest influences on accuracy is the motor thrust to boat weight ratio. If you have a high thrust motor on little dinghy or Jon boat, it’s going to be overpowering and overcorrecting continuously. Not enough thrust on a larger vessel is going to cause a lot of lag in the trolling motor. Even when you have the correct thrust to boat weight ratio, you might still have issues with staying on course using anchoring or i-track functions. IF you do not compensate motor speed with environmental conditions, you might find the boat wandering off course when trying to follow a recorded track. The GPS signal is also going to affect the accuracy of the various i-Pilot features. The low signal is going to hurt the accuracy which is unfortunate for a lot of users who like to tackle more remote waters. The water you are on is also going to impact accuracy. Very choppy waters (high winds) and heavy currents are going to make it more difficult for the motor to stay in line with a saved course or keep the boat within several feet of an anchor point. It's not going to put you on the other side of the lake, but it might put you off several feet from where you want to be. For the most part, that's nothing, and no one of are going to be concerned with several feet, but if you're trying to use the system in tight quarters, you are going to want to keep an eye on your position. With that, we also wanted to mention battery power here because it interconnects with accuracy to some degree. Rough waters and heavy current are going to put more of a strain on your motor to keep the boat in position and might require pulling a lot more power to do so. So, if you are in those situations, be sure to keep an eye on the battery meter. The Minn Kota i-Pilot and i-Pilot link are available on several of the company's freshwater motors as well as the saltwater Riptide motors. Below, we have listed all of the Minn Kota trolling motor lines that come with the i-Pilot or i-Pilot link. Though many were skeptical of the Minn Kota i-Pilot a decade ago, it has become a mainstay on many angler’s boats. It provides a lot of advantages to the angler and allows a much more hands off approach to trolling allowing the angler to focus more on what he or she is on the water to do. It’s not a perfect system, but we hope that this article has outlined what makes it special and some of the problems you might encounter. It’s a fun time to be a fisherman and we are excited to see where i-Pilot goes from here.